Pleven horses are competition horses with a natural jump and free-flowing gaits. Pleven horses were developed in 1898 in the Klementina stud (now called the Georgi Dimitrov Agricultural Center) in Bulgaria. Plevens are mostly Anglo-Arab, but Gidran stallions were later added to the breed. They were officially recognized in 1951, and English Thoroughbred blood was further added to add refinement and size to Plevens. The breed is still selectively bred throughout Bulgaria, and an effort is being made to increase their size, which would make it more attractive as an international sport horse. The Pleven's head has a straight profile, a long, muscular neck, and a nice top line. They are excellent movers, whose free-flowing gaits make them excel in dressage. They have fairly long backs and high withers, with quarters that are muscular, croups which are slightly sloping, and a tail that is carried well. Their legs are well-conformed and muscular, have good bone joints, well-defined tendons, and hard feet. Their temperament is calm and willing. The Pleven is usually sound, tough, and economical to feed. 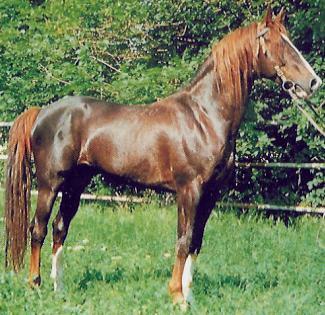 Plevens are always chestnut in color, and stand at 15.2 to 16 hands high.